Do you love the modern, sleek style of Brickell décor? Are you dreaming of incorporating some of that sharp look into your home or next business project? Before you start searching the catalogs for the perfect accessories, consider how you can get the look and atmosphere of that Brickell style with marble flooring. When you work with the right supplier, you can get the look you love without breaking the bank. You can also take advantage of superior quality stones in order to create a sharp look that will last for decades to come. When designing a new space, your first goal is to set the right tone. While paint, fabric swatches and accessories are important, it’s the building materials you use that will really set this tone. Brickell is the hot new neighborhood of the Miami area, and it’s known for its hip social scene, cool looks, and clean environment. When you want to bring this feeling to your home or business, start with the right building materials. One of the top choices is marble flooring. It has a timeless look that works beautifully with the modern feel of Brickell, and it’s got that high-end polish that lets everyone know you have arrived. 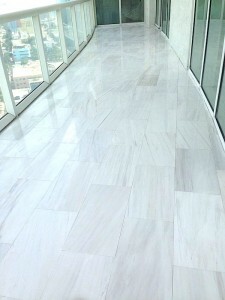 While carpeting may the choice for people in cool climates and colorful ceramics are hot in the Caribbean, you may find that marble is the right building material when you want to create a cool yet chic feel that fits right in with Brickell. Brickell is home to some impressive skyscrapers, and it has a modern feel that’s rivaled by more well-known cities. The lines are sleek are smooth, and the colors tend toward brighter shades of white and blue to match the climate. You can mirror this modern look and finish by skipping all the other materials and reaching for brilliant white marble stones. The clean lines are consistent with Brickell, and the true color may be exactly what you’re looking for. Whether you’re dressing up a bathroom to remind you of our time in the Miami area or you want to bring this beautiful landscape to your dining area, Bianco Dolomiti and Vanilla Oro tiles will help you create the perfect look. One thing that really stands out in the Brickell landscape is the reflective surfaces. High-rise buildings lined with glass shimmer in the sun, and crystal clear pools reflect everything near them. The sun shines bright on Brickell throughout the year, so it’s important to work this reflective nature into your building plan. While white marble will naturally reflect more light than other colors, it’s important to consider the finish. Highly polished stones are more reflective and will provide you with a better fit for the Brickell theme. You may be concerned about slipping on floors that have been polished to a high shine, but you can overcome this problem with the right sealing agents. Specially designed products allow you to seal the floors while adding just a little bit of traction for safety. This allows you to use those polished products while ensuring that your place is safe for regular use. While it’s easy to focus on the bright and brilliant colors that define some areas of Southern Florida, remember that the modern décor in Brickell also embraces deeper colors. Consider finishing a floor in Rojo Alicante to make one area of your project stand out with beautiful style. You can also go with black granite in areas to add some depth and dimension to any pattern. Arizona Ivory travertine is also an excellent choice because it features intricate veining that gives the tiles the illusion of movement. It’s reminiscent of the sea, and that can be perfect for any project that’s drawing inspiration from the beauty of the Brickell neighborhood. Marble flooring isn’t just for the interior of your home either. It can be installed throughout the property, including exterior applications. When finishing off your pool deck, skip the plain concrete and go with marble tiles for a finish that’s worthy of Brickell or any upscale area. Use it in the outdoor kitchen to make this space more luxurious. Install it in the garden of your home, or use it as a walkway alongside the main drive. Carry the same colors onto the front porch and into key areas of your home for a cohesive look. You may be worried about the initial purchase price of marble, but it’s actually a very cost-effective choice. Marble can last a lifetime with just a little care and maintenance. It was used in some of society’s earliest buildings, and it still looks amazing centuries later. This means that the flooring you install today may never have to be replaced. You’ll also find that this neutral building material can work with a Brickell theme or a more traditional look. This means that the interior décor can easily be changed and updated without having to add flooring to the budget. You’ll also find that you can save money on the initial purchase by working with a wholesaler when it’s time to make this investment. With Nalboor, you can leave the retail prices behind and save money with wholesale rates on high-quality materials. If you’re ready to embrace the look of Brickell in your own project, then see how the friendly professionals at Nalboor can assist you. We offer wholesale prices on a range of marble tiles so that you can afford to use this timeless material in all of your upcoming projects. You’ll never grow tired of the beautiful material, and it will work with any decorating theme. Give us a call today to speak with our customer service representatives and place your order. You deserve to have a beautiful home, and it all starts with attractive, durable materials that can help you create the perfect look and feel.